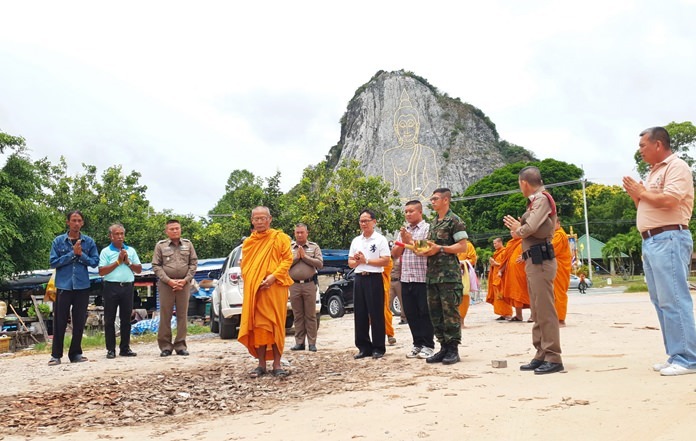 Sattahip residents pray for the spirits of a young couple gunned down at the foot of Buddha Mountain and for the capture of their alleged killer. Sattahip residents prayed for the spirits of a young couple gunned down at the foot of Buddha Mountain and for the capture of their alleged killer. District Chief Anucha Intasorn joined Sangkarak Pongsiri Papatsaro, chairman of the Khao Ploy Dharma Retreat, police, Sattahip Red Cross volunteers and the public for the Aug. 10 merit-making ceremony. Anucha said the entire Khao Chee Chan community was horrified at the brazen daytime murders of 20-year-old Paveena Namuangrak and Anantachai Jaritrum, 21, on July 29, allegedly by fugitive Phuket bar owner Panya Yingang and five accomplices. All the accused accomplices are now in custody, but Panya is believed to have escaped to Cambodia. The alleged 43-year-old mastermind killed the young woman, a former teen beauty queen who began working in his Phuket go-go bar at age 16, because she refused to be his mistress and he wrongly assumed Anantachai was her boyfriend. Nine local monks were invited to the ceremony to chant “Buddhajayamangala” (“The Buddha’s Auspicious Victories”) to rid the holy site of the bad luck emanating from their killings. Najomtien police chief Pol. Col. Atorn Chinthong said he has ordered more random checkpoints and patrols for the Khao Chee Chan area to instill confidence in tourists and protect their safety.